Sure, a backyard swimming pool is enticing, but add the visual pop of color and promise of good times floating on a giant piece of food or goofing around with your friends, and it becomes almost irresistable. Another use: as a fun and glamorous prop for selfies and Instapics on social media sites and apps like Instagram, Snapchat, and VSCO. Fill your pool or yard with a few of these inflatables, and get ready for an instant party and pictures. Who doesn't look adorable floating on a giant pink-frosted donut with sprinkles, or a big piece of pizza? You've seen them in photos and at the grand openings of new donut shops and wished that you, too, could have a giant donut. Made by BigMouth Inc.
Also comes in a giant chocolate flavor with sprinkles. It's a natural that a long Tootsie Roll would be the perfect thing to make into a giant noodle pool float. This one, from BigMouth, inflates to 5 feet long and includes a patch kit. Pizza lovers get their day in the sun, with this BigMouth giant slice-of-pizza pool float, good for one person to lounge on all day. Inflates to 5 feet long and comes with a patch kit. If you view your backyard pool as an oversized bathtub, then this giant rubber ducky might be right in scale. Unlike the bathtub version, your child can ride on this one - a dream come true! Made by Swimline, this yellow inflatable is 60 inches inches long by 48 inches tall. Giant beach ball. Courtesy of Amazon. Imagine the ice-breaking possibilities, photo ops, and crowd-pleasing fun of a giant classic beach ball! If the idea of luxuriating the day away on a really big ice cream sandwich tickles your fancy, then this float is perfect. It features cushioned. With its twisting, loopy possibilities, a giant inflatable pretzel will allow you and your friends to look cute and each have a space to hang onto. This swan is so big, it's like an island floating in your pool. Ample enough for two (small and lightweight) loungers. Made of vinyl and super-sized at 75 inches long. Swan's neck has a pair of convenient-grip handles. Although two adults are pictured on the float, it has a 140-pound weight capacity, meaning it can only accommodate one adult or two kids. Fruit lovers will be happy to be represented with this giant slice of watermelon. Decorate your pool with fun food floats, like the donuts, giant ice cream sandwich, and these smaller, yummy-looking ice cream cones for individual floats. 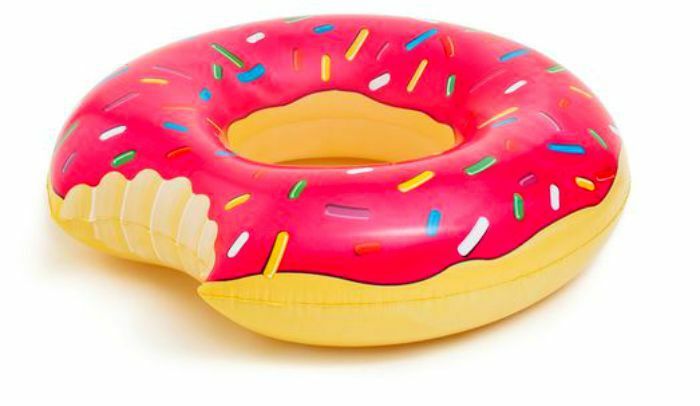 More of a traditional round, donut-shaped (not literally a donut) float, the Day Dreamer is a durable inflatable that comes in several colors with a tropical graphic. This big sunflower by Swimline measures 72 inches in diameter and will have you sitting pretty in the pool or for pictures. Durable and built to last.